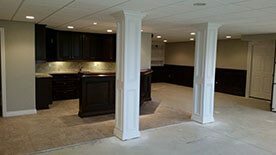 As you approach the basement renovation, a very important detail that needs to be picked out correctly is the basement flooring. In order to create a warm inviting setting, hard cold concrete floors are usually not the greatest option. 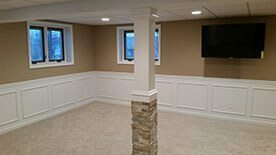 There are multiple ways to make the basement a more livable and useful space, one of which is the utilization of basement paint. This is an inexpensive option and can help with basement water issues. You’ll want to make sure you pick semi-permeable latex paint because normal paint will likely start peeling after a few months. Another viable option for flooring would be basement carpeting. Having carpet on your floors is very warm to your feet and can be quite comforting in colder climates. 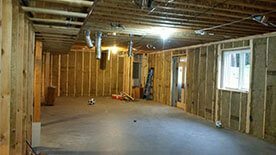 This is a great option especially if you plan on converting the basement into extra living space. 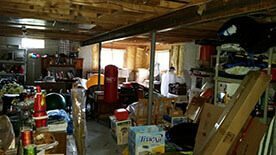 Before you choose basement carpeting for the flooring you’ll want to be sure you take care of any water leaks or moisture issues. By not taking care of the water seepage, basement carpeting can be a poor decision. Carpet takes a long time to dry after getting wet. The carpet fibers can harbor mold which thrives in a wet, humid atmosphere. This confirms the importance of fixing any water leaks and proper ventilation in the basement. By doing so, you’ll increase the lifespan of your carpet and make sure your family is safe and healthy by decreasing the amount of molds and bacteria in the carpet. 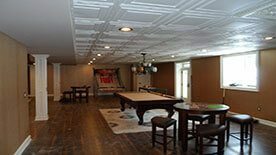 If basement carpeting is your flooring of choice, one method is to prevent water seepage is by placing a layer of felt or polystyrene foam on the floor underneath the carpet. You can trim this layer to fit the floor as needed. Following this step, we’ll place a layer of sub flooring on top of the foam/felt. By taking this approach we’ll be able to prevent moisture from building up and getting to the carpet. In addition to the anti-moisture properties, it will also help with overall flooring comfort. Another possible low maintenance option for basement flooring is tiles. Generally they are easy to clean and resistant to spills and staining. The choices for tiles are almost endless (colors, styles, textures) which can be a great thing for you, the shopper. However, the one downside with tile is without a heated basement, they can be extremely cold in the winter time. You’ll want to be sure to think through your options during the design process and before the construction phase begins. Our team is trained to help you figure out these details and to stay within budget.